He is definitely a guy who knows his trade and is well respected for his time at the ICC Academy. But then, I heard he was also involved with LQ, if he is against T20 leagues, he should abstain from it. Coming on to his comments regarding if you're focusing on t20, it will hurt your Test career which is absolutely right. Only those guys who have the basics right and can adapt can go on to have successful careers in all formats like Kohli, Smith, Faf, KW, Stokes, Khawaja, De Kock, Markram(a work in progress) and some others. It's pretty clear that guys like Chris Lynn, Jason Roy, Russell, Lewis etc are bound to fail in Test cricket if given opportunity. But t20 leagues can have a good effect on players for ODI's though. The aggressive nature of t20s can help guys face unfamiliar and difficult situations and can help them develop new shots and stuff to keep at level with the world. One anomaly I can think of is Colin Munro, I think even with his uber aggressive batting style, he can still be successful in Test Cricket as he is a very careful watcher of the ball and has amazing hand eye coordination. It is also reflected by his FC stats with average of over 50. Mudasser Nazar is one of the best things that have happened to Pak cricket. No wonder we were superior in youth ranks till 2008 something. Also Mickey trusts his judgement a lot (read Mickey's interview). We need people like him as director of cricket operations even though he has already made a huge difference at the NCA. Hope he stays at the PCB so that we keep improving our youth ranks and see more Shaheen's + Saud Shakeel's. He has a very cool head and always speaks sense. Need him involved in cricket for a few more years. I still don’t get why t20 is not impacting players in the bigger teams. I can however believe, that our perennially rubbish domestic batsmen have now even lesser incentive to sort out their technique. Even if you buy Mudassars argument at face value, there’s little that can be done to stem the tide. T20 and the opportunity to be fast tracked through it to lucrative leagues or the national team will far outweigh the need to foil away in 4 day cricket. I hope, after such an interview, Mudassar can keep his job. Basically, he has opened an can of worm which we have discussed many times here in PP. He is a man who has been charged with developing good cricketers from the academies so its good we know what his aims are. I see that, he has noticed PAK A team selection isn't like what it should be, but probably that's out of his scope, hence he has been politically correct here; but don't think with this selection policy (of A team/emerging team), he can't do much development with U19 & U23 players. I have a lot of respect and regards for Mudasir from my childhood days though have never seen him playing but have heard a lot about him from my father how Mudasir was a go to guy for Imran khan. Someone who made the maximum use of his talent (limited) to become one of our top cricketers in 80s and this is exactly the kind of people that we need in pCB's set up, players who were not god gifted but made it through with their grit and never say never attitude. This is what is missing in our younger lot, we seem to be producing a lot of softies nowadays, those we shy away from the contest once a bit of pressure is exerted on them. Our young players specially batsmen are all of defensive mindset, this needs to change and this can only change from the gross root level where we need people with positive mindset, those who know how to take bull by the horns and Mudasir indeed is one of them. A wonderful read, really enjoyed it. 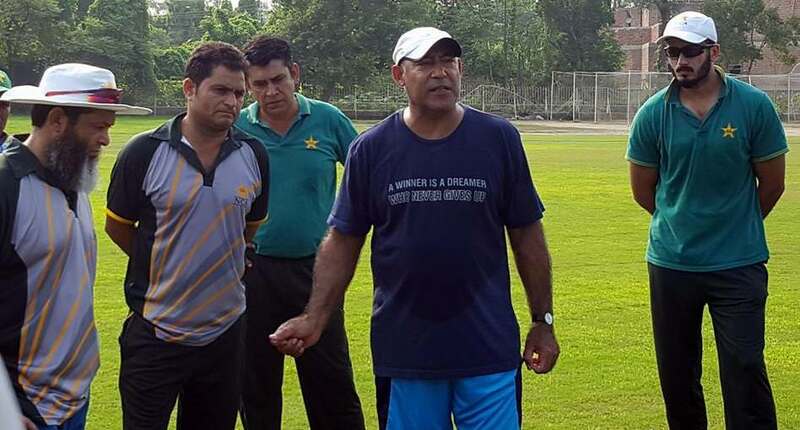 Mudassar Nazar is exactly what Pakistan cricket needs and him leaving his role at the PCB meant that a whole generation of cricketers were lost in the system. He has a great cricketing mind and is well-respected throughut the cricketing world. There are quite a few people out there who want to take credit for the development of players whilst the actual credit should go to people like Mudassar Nazar. The reason Mickey Arthur trusts Muddasser with all the upcoming players. Probably also why he fast tracked Shaheen Shah + Shadab into the national side (after Muddaser's recommendation). T-20's are a reality of today, Kohli is the only one who has successfully made adjustments to all formats. Other batsmen should have no excuse. T20 skills are need of the moment. Technique without skills, not T20s, is what's detrimental. Following cricket for last 40 years, the issue with Pak batters is same, can't play ball moving outside the off. Indian bowlers cant sustain pressure of bowling fast. Eng and Aus weak on spin tracks. Issues are still the same. T20 can never be an excuse, even now your number one T20 batter is best player in test as well! It is about skill set and mind set! Set these two aspects and you are set! Look at indian batsmen why are they not getting effected? We are producing rubbish stop blaming it on T20s. The batting department is BARE EMPTY and it is really a MASSIVE concern if you are a true Pakistan fan. Muddy says it how it is and unfortunately when FC cricket would not get any attention or priority and T20 leagues will be getting pumped with all the money and so on then this was and is bound to happen. Pakistan's batting resources have been bare for the last 5-10 years almost. Because they still take 4-day cricket seriously and want to compete to be the best in that format. Wow. Some really insightful comments. He is very considered in his views and raises issues I hadn't even thought about. Hope his interviews become a regular feature @saj. Yes, but Mudassar needs support through the system. At the moment too many players in domestic cricket who get picked due to who they know and not how good they are. Think the result of the Emerging Teams Cup points to what Mudasser was talking about. Why are our domestic test games for only 4 days? I wonder why can't they extent this to 5 days to replicate the exact test match format. This might go a long way in helping players develop that mindset that a test match lasts for 5 days. As it is most of our games are not lasting longer than 1-2 days. I would personally like the no of teams, amount of matches reduced but each domestic game should be a 5 day test match. Its been 2 and a half years since Mudassar was appointed as the head of academies, what has he achieved and delivered up till now? 5 day test matches that finish inside 3 days you might need Mudassar Nazar to bat himself to last the full 5 days. Think about the current schedule - they cram the FC season into the space of three months. Many of these pitches are re-used and groundstaff aren't given sufficient time between matches to prepare the surfaces even though many matches don't even last 4 days. The schedule just doesn't allow any flexibility. Regarding Mudassar's point - this is a cheap excuse. India have the biggest T20 tournament in the world and it hasn't impacted the production line of quality young batsmen. They are #1 in the Test rankings no less. The problems are closer to home and some of them aren't in his control. Schools aren't producing the talent they once did with many kids choosing academics over sport as a career. In the 1950s, there was intense competition between the top colleges and many Test players came from that system. There needs to be an effort to incentivise cricket scholarships and enable students to balance their studies and sport. The coaching at grassroots and junior level needs investment by PCB, who should set up an academy just for coaches so they've the proper qualifications. Coaching is like any profession and requires a different skillset with specialised technical knowledge. Playing a few Tests in the 70s shouldn't qualify you to run an academy. Then there's the domestic setup where too many players have First Class contracts despite little to show for it. If you're a specialist batsman and you average less than 30 you have no business playing First Class cricket ! This is a product of having too many teams with no quality control. It's no surprise as the number of FC teams have expanded, the standards of FC cricket has declined. It affects globally. But guys like Faf duplessis, Kane williamson, Kohli are able to adapt himself and switches between the formats seamlessly. People look at Pujara like an alien for his style of cricket. Since he has no IPL contract he has gone right back to domestic cricket playing for his state without wasting anytime. Babar looks good in all formats although he has some distance to go in Tests. That is why reducing the no of teams to a maximum of 10 will go a long way. Not sure i agree with Muddy Pa. He seems to be stuck in the 80's. If T-20 cricket was indeed a problem, Pakistan would not be having a power hitting crisis that it faces today for a long time, i have lost count of the numerous amount of games we have lost chasing because of the inability to hit sixes at the end and falling short by 6-7 runs, 10-15 runs. If T20 cricket was indeed to blame for our batting problems, we would have plenty of batsmen coming through the ranks who were hitting sixes, T-20 Cricket has not hurt the Big 5's limited overs batting. Why should we be the unique exception? Has the T20 format impacted the batsmen's focus for Longer format? Ever since the T20 format is introduced there is an increase in demand for powerful hitters, which might be the reason scores in excess of 300/400 are being scored in ODIs. This has definitely helped other teams. Pak on the other hand is witnessing batsmen who dont have the hunger or patience to stay on crease a long time like in ODIs or tests. Instead, it simply puts pressure on them as they cant take ones or twos which is highly required in ODIs and start playing the unnecessary slogs like in T20s and get out. All times are GMT 5.5. The time now is 00:40.